Nuvi's 500 series has been specifically designed for driving, cycling, walking or boating, with maps to suit each activity. The 500 series features NavTeq sophisticated mapping data and the ability to accept different types of mapping including TOPO for outdoor navigation and Blue Chart cartography for marine usage. The new Garmin is perfect for outdoorsy types, with a shaded digital elevation map option and a dedicated compass page and tracklog, just the ticket for keen ramblers and fans of orienteering. Clive Taylor, Garmin's Director of Product, refers to the nüvi 500 series as "a true chameleon in the gadget world," because, "it extends the use of GPS across the range, from walking to cycling to driving to boating. "It's ideal for individuals or families who want to go and explore the great outdoors in every way they can. With the built-in compass and integrated Wherigo(TM) and Geocaching player the sat-nav's use is extended beyond just navigating: Users can enjoy the fun of the many family treasure hunts and adventures available online." The waterproof nüvi 500 series features all the latest Garmin navigation technology including Hotfix, detailed NavTeq mapping, millions of points of interest (POIs), traffic avoidance compatibility and Garmin's popular "Where am I?" safety feature (immediately giving you your exact latitude and longitude coordinates). Garmin Connect Photos gives you instant access to millions of geo-located images provided by Google's Panoramio if you would rather 'photo-navigate' on your jaunts. 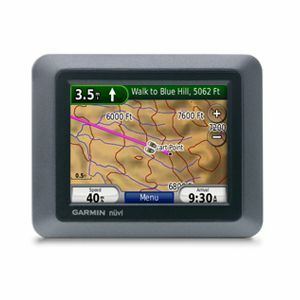 For more on the Wherigo GPS fun and games and the Geocaching adventure game you can see Garmin's own official minisites (linked here). For boating use, if loaded with optional BlueChart g2 Vision marine cartography, the nüvi 500 series provides detailed chart-specific information, spot soundings, inter tidal zones, wrecks, port plans, restricted areas and a lot more. The nüvi 500 is ideal for the occasional boating enthusiast who wants one navigational device for foot, car, bike or boat. And is being demoed this week and next at the British International Motor Show at ExCel, London.